In the centre of Trafalgar Square Nelson's column stands at a majestic 185ft. Nelson himself is 17ft. The top of the column is surrounded by acanthus leaves cast from British canons. At the base are 4 relief panels made with armaments captured from the French. In each corner stand 4 huge lions. In this picture a pigeon sits on top of Nelson's head. Maybe generals can learn from this. No matter how big you are, you can still be shat on! That's it for today. Have a train to catch to Paris now. I may not get to visit all of you in the next few days but will try and catch up by next week. Yes, when "Louis" has visited London, he's noticed that poor Horatio is a favourite target for bombing raids by pigeons. Those flying rats have no respect for anyone! Nice picture, nice light! I am wondering where you took that picture from? Have a good wk in paris. Beautiful,the historical column in the blue sky. I like the light and how it lights him up. Nice shot. Thanks for the details, I've learnt something new today. Oh wow! This is a lovely shot I wouldn't have noticed the pigeon if didn't mention it! Lovely structures too! awesome swf! 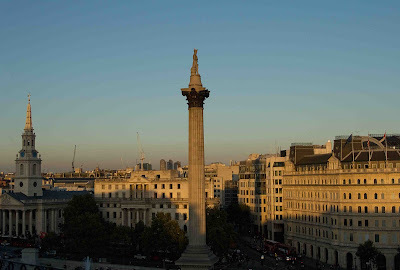 A great shot of Nelson's Column with lovely afternoon light. You must have been qute high up to get this one, not just a double decker bus. Beautiful early morning? shot. Enjoy Paris. Will you be seeing Eric? A good shot, compliments mine a little bit. Which building did you take that from? Enjoy Paris. Bring back some good photos. I believe this scene would hold a lot of beauty at any time, but you captured it with amazing lighting. Well done! For those who asked. This was taken from the garden terrace at the top of the Trafalgar. Great scene to capture for SkyWAtch! Greetings from Iowa, USA. Stunning photo! I guess we can all be shat upon, lol. What a perfectly breathtaking parting shot!